WELCOME TO OUR WILD HORSE SHOPPING OPTIONS - BROWSE, SHOP AND ENJOY! ALL SALES GO TO BENEFIT THE WILD HORSES OF THE VIRGINIA RANGE - both our rescued horses and those still living wild and free on the range! Support the Hidden Valley Wild Horses by doing all your shopping at Amazon Smile !! Shop 'til you drop or fall off your chair at Amazon Smile! AmazonSmile is a website operated by Amazon that lets customers enjoy the same wide selection of products, low prices, and convenient shopping features as on Amazon.com. The difference is that when customers shop on AmazonSmile (smile.amazon.com), the AmazonSmile Foundation will donate 0.5% of the price of eligible purchases to Hidden Valley Wild Horse Protection Fund! You log in with your regular Amazon user ID and password, then the first time you select Hidden Valley Wild Horse Protection Fund as your charity of choice. After that just make sure you log in at smile.amazon.com when you do your shopping! It's FREE and so easy to do - once installed the iGive button will automatically appear on your browser screen when you shop at one of over 17,000 participating online merchants. YOU NEVER PAY MORE!! A portion of your purchase will be donated to the organization of your choice. 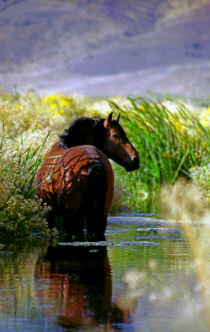 We hope you'll give it a try and make HIDDEN VALLEY WILD HORSE PROTECTION FUND the recipient of your kind contribution! iGive.com takes care of all the details - they work with the merchants directly, handle all the funds, and show you how much of your purchase will be donated. Select Hidden Valley Wild Horse Protection Fund as your organization of choice and start your online shopping on a positive and warm socially responsible note. 2017 CALENDARS - donated by local Reno resident and photographer Ellen Holcomb. 100% of the proceeds from the sale price of the calendars will go directly to benefit the rescued horses of Hidden Valley Wild Horse Protection Fund, as well as the wild and free mustangs of the Virginia Range! 2017 Wild and Free on the Range calendars feature horses up for adoption in our rescued herds! 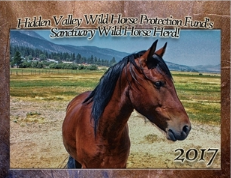 The link above will take you to a secure website authorized by Hidden Valley Wild Horse Protection Fund to produce, sell, and ship these calendars. Steven Saylor has created a Special Edition of 100 signed and numbered prints of “Rambles, Our Little Mustang”. Each print is a 9” x 12” with a one inch border size and sells for $100.00. A Certificate of Authenticity will be included with each print. Steven Saylor has also created 25 remarqued Artist Proofs in the edition. Each remarque is a 9” x 12” with a one inch border size of “Rambles, Our Little Mustang”, and will also be signed and numbered. A remarque has a drawing in the margin area and each drawing is different and relates to the wild horses. Each Remarque sells for $160.00 and will include a Certificate of Authenticity. Steven Saylor is also offering the original for sale at a cost of $3,500.00. 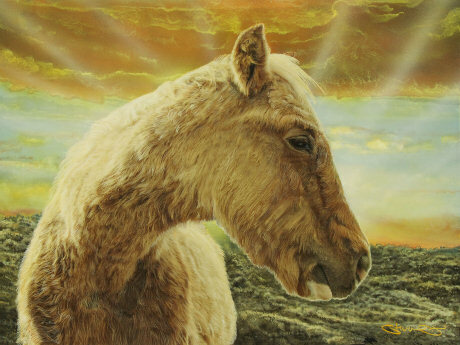 Please contact hiddenvalleywildhorses@gmail.com if you are interested in purchasing the original “Rambles, Our Little Mustang” or Steven Saylor directly at Evergreen Studio. Each item will be automatically charged $9.00 shipping via USPS Priority insured mail. We are very honored to announce that 50% of the sale price of each print and remarque, and 30% of the original will go directly to Hidden Valley Wild Horse Protection Fund to be used to benefit our rescued horses as well as the wild and free horses of the Virginia Range. Rambles, Our Little Mustang, was rescued from the Fallon livestock auction on January 9, 2013. She was a wonderful surprise to us all and gave joy and pleasure to those who had the honor of making her acquaintance. Rambles was adopted by famed artist Steven Saylor and his wife Johnye, who loved and cared for our wee Rambles on their beautiful ranch filled with so many other wonderful creatures – she was not lacking in love and attention. They gave her a safe and loving home until she succumbed to complications caused by pre-existing health conditions on April 26, 2013. Steven has captured the pure innocence and love that was Rambles, our gentle, loving, sweet little Virginia Range wild mustang! Please also visit Steven Saylor’s Evergreen Studio for more wonderful images. For international shipping, please contact us directly at hiddenvalleywildhorses@gmail.com so we can work directly with you to find the best shipping options. We appreciate that you've taken the time to visit our website and do some shopping. We hope that you are pleased with the selection of items available. Stay tuned for more items to come. Please consider making a donation or opening a sponsorship.